Iran is a major player, supporting the government of Syria, and offering support to the government of Iraq in its struggle against ISIS. It has a nuclear program which proved to be highly controversial and was a subject of P5+1 negotiations; Joint Comprehensive Plan of Action was an outcome. The Annex to the Director General’s November 2011 report (GOV/2011/65) provided a detailed analysis of the information available to the Agency at that time, indicating that Iran has carried out activities that are relevant to the development of a nuclear explosive device. 20% U-235 (447.8 kg of such nuclear material), all of which has been further processed through downblending or conversion into uranium oxide. 7765 kg remain in the form of UF6 enriched up to 5% U-235. IAEA and Iran held discussions on the practical measures relating to the initiation of high explosives and to neutron transport calculations. IAEA and Iran held discussions on the need or application for the development of Exploding Bridge Wire detonators. (L. ,p. 14) "While the Agency continues to verify the non-diversion of declared nuclear material at the nuclear facilities... the Agency is not in a position to provide credible assurance about the absence of undeclared nuclear material and activities in Iran, and therefore to conclude that all nuclear material in Iran is in peaceful activities". 22 September, 2014 english.alarabiya.net U.S. Secretary of State John Kerry on Sunday raised the threat of Islamic militants in Iraq and Syria directly with his Iranian counterpart in high-level talks in New York, a U.S. official said, according to Agence France Presse. IAEA. OCT. 31, 2014, NY Times The director general of the International Atomic Energy Agency, Yukiya Amano, said commitments Iran had made to provide more information on what he called “possible military dimensions” had not been carried out. He said that while he had received assurances from Iran’s president, Hassan Rouhani, that he was “willing to clarify the ambiguity” in documents and computer records that appear to show work on a variety of technologies that can be used to detonate a weapon, the cooperation had not been forthcoming. 04.11.14 Tashin news agency google translated: "3. The participants in this grand gathering of Ashoura, password and authority of the state and the nation against the hegemonic system and follow the school of Ashura, Yazid times the strength and resistance to oppressive America and the powers, while supporting the government and the oppressor and the know arrogant diplomacy in the nuclear negotiations with P5 + 1 and emphasize compliance framework drawn up by the Leader of the Islamic Revolution of Iran zealous for the inalienable right people, meticulous removal of unilateral sanctions against Iran and take care cruel and respected representatives of Parliament Houshmandi The definitive agreements and their potential to seriously consider the demands of the real sponsors of terrorism, violence and extremism and false claims law of nations, will not let the greed Khlly on the road to discrimination and, and the inalienable rights of obstructing nation forward". "Thirteenth of November 1393 Solar Hjry- Coinciding with the tenth of Moharram 1436 AH Fourth of November 2014 Mena Lo Alzlh - Death to America Death to Israel Death to Britain"
21.7.15 U.S. Secretary of State John Kerry said a speech by Iranian Supreme Leader Ali Khamenei on Saturday vowing to defy American policies in the region despite a deal with world powers over Tehran's nuclear program was "very troubling". his role as one of the sources for the now heavily disputed 2007 National Intelligence Estimate (NIE) that downplayed Iran's suspected nuclear weapons operations has raised further doubts. The US intelligence community has been working on a new NIE that will give a much more alarming assessment of the Islamic republication's atomic bomb ambitions. U.S. Says Scientist Aided C.I.A. While Still in Iran, NY Times, 15 July 2010. While still in Iran, he was also one of the sources for a much-disputed National Intelligence Estimate on Iran’s suspected weapons program, published in 2007, the officials said. For several years, Mr. Amiri provided what one official described as “significant, original” information about secret aspects of his country’s nuclear program, according to the Americans...It is unclear how Mr. Amiri’s information fed into the 2007 intelligence estimate. That document contended that Iran halted its design work on a nuclear weapon in 2003. The amount of WGU required for one weapon is defined by the International Atomic Energy Agency (IAEA) as about 27 kg of uranium. This amount is often called a "significant quantity" (SQ). Natural uranium has only 0.7 percent of the isotope U-235, and the effort required to enrich it to one SQ of WGU is about 5,000 Separative Work Units (SWUs). Iran currently has about 9,000 functioning first-generation IR-1 centrifuges, with another 9,000 not in operation. The IR-1s installed in the Natanz and Fordow facilities have been performing at an average per unit rate of 0.75 to 1 SWU per year. Using the 1 SWU/year performance of the latest IR-1 model, the breakout time with 9,000 machines using a natural uranium feed would be six to seven months. However, Iran also has substantial stocks of 3.5 percent enriched uranium hexafluoride (UF6) that can be used as an alternative feed, shrinking the breakout time to three months. If Iran brought online its other nearly 9,000 IR-1s,(18,000 total) breakout time would be about three months with natural uranium feedstock and four to six weeks with 3.5 percent UF6 feedstock. Iran has also developed the more advanced IR-2m centrifuge, rated at 5 SWU/year. If the 1,000 IR-2ms installed at Natanz were used in conjunction with all 18,000 IR-1s, the respective breakout times would be cut by a third. If it had not been for our capability to achieve 20-percent enrichment and to build advanced centrifuges, we would definitely have failed to force them into accepting these several thousand centrifuges so much so that they would not criticize it anymore. The operational capabilities of the nuclear industry and the nuclear organization should prevail. Its manpower should be preserved. The capability to restore the prior conditions should be preserved as well. In the present time, this capability fortunately exists. I will tell you that in less than six months, they can help the country develop 18,000 SWUs with the same IR-1s, which are the old machines we used to use. Just right now, this possibility exists in less than six months. This means that the other side should not think that our hands are tied. We can develop 100,000 SWUs in less than a year and a half with the pieces of IR-4s - which are advanced second and third generations – and with other equipment that are available to us. MoA, May 21, 2018: Pompeo demands that Iran closes its heavy water reactor. Iran can not close its heavy water reactor. It does not have one. The one it was building in Arak was disabled under the nuclear agreement (JCPOA). Concrete was poured into its core under supervision of IAEA inspectors. How can the Secretary of State of the United States make such a fact-free demand in a prepared speech? 28.3.15 A framework agreement is discussed. It is believed by some observers that some sort of a deal before the self-imposed March 31 deadline is close. Progress on some of the issues; but not all issues indicated. Iran will reduce its current stockpile of low-enriched uranium, which can be processed into bomb-grade fuel, by 98 percent to 300 kilograms (about 660 pounds) for 15 years. Iran will reduce by two-thirds, to 5,060, the number of centrifuges operating to enrich uranium at its primary processing center in Natanz. Remaining centrifuges get moved to a continuously monitored storage site. Taken together, the limits on fuel and centrifuges would extend, to one year, the amount of time necessary for Iran to produce enough weapons-grade material for a single bomb if it should abandon the accord. International sanctions against Iran will be lifted, allowing it to start selling oil again on international markets and using the global financial system for trade. An international arms embargo on Iran would be eased gradually, with the pace determined in part by whether the International Atomic Energy Agency judges the Iranian nuclear program to be entirely peaceful. Should Iran be judged by an international panel not to be living up to the accord, the sanctions could “snap back” under an unusual mechanism. The panel would consist of the United States, Britain, China, France, Germany, the European Union, Russia and Iran itself, with a majority vote of the eight members sufficient to restore the sanctions. "Iran threatened to pull out of nuclear talks if U.S. started hitting Assad forces in Syria", Andrea Mitchell, 22 Aug 2016. 23.7 Details on side agreements requested by Congress. According to the lawmakers, one agreement covers inspection of the Parchin military complex, and the other concerns potential military aspects of Iran's nuclear program. On the former, they said, Iran would be able to strike a separate arrangement with the IAEA concerning inspections at Parchin. Before Congress can render judgment on the nuclear deal with Iran, it must fully understand how the agreement will address Iran’s previous efforts to develop nuclear weapons. The International Atomic Energy Agency (IAEA) calls these activities the possible military dimensions (PMD) of Iran’s nuclear program, and they include everything from covert tests of nuclear detonators to designing warheads. However, although Iran has agreed to a Roadmap to address the IAEA’s concerns, the document does not explicitly condition sanctions relief on the resolution of PMD, effectively giving Tehran little incentive to fulfill its obligations. "Did Iran just renege on Obama’s nuclear deal?" Washington Times, 10.11.2015. Last week Iran began shutting down inactive centrifuges at the Natanz and Fordow nuclear plants after multiple hardline parliament members complained to Iranian President Hassan Rouhani that the process was moving too fast. “The (dismantling) process stopped with a warning,” Ali Shamkhani, Secretary of the National Security Council, was quoted as saying by the ISNA student news agency, reported Reuters. The conservative parliamentarians complained the act of shutting down the centrifuges did not comply with the wishes of Iran’s Supreme Leader, Ayatollah Ali Khamenei. Khamenei has said that the Iran nuclear ‘deal’ should only be allowed to move forward after the issue of Iran’s nuclear Past Military Dimensions (PMD) had been settled. Iran's Oil Will Just Make Life Worse for Gulf Rivals, Bloomberg, Jan.17, 2016. (c) 'there is a side deal' or 'a protocol' requiring signatories to defend Iran against 'third party' (= Israel), according to a radio talking mouth. Exact document and phrasing, unclear. (d) Chain of custody? While googling, a ruckus on whether Iran is given to self-inspect itself, or, in a different presentation (+different political camp), with enough videoing and other gadgeting, sufficient chain of custody can be maintained. The story, written by the Associated Press, cited a draft version of a secret side agreement that’s a part of the larger Iranian nuclear deal, saying the International Atomic Energy Agency (IAEA) had ceded the investigation of Iran’s Parchin military facility to the Islamic republic. Rauf, former Head of Verification and Security Policy Coordination at the IAEA it would be unusual but by no means technically compromising to have Iranian technicians collect swipe samples at sites and locations at Parchin in the physical presence and direct line of sight of IAEA inspectors, including filming, and using swipe kits and collection bags provided by the IAEA.” “mainly to guard against the risk of inadvertent contamination from nuclear material traces on the protective clothing of the inspectors”. Labs use “very sophisticated analyses nuclear material using electron microscopes and mass spectrometers can be detected at the atomic level.(armscontrol.org/blog). "IRGC Commander: Iran's New Long-Range Ballistic Missile (Emad) Alters Balance", Fars News, 10.11.2015. Iran unveiled a new underground missile depot with state television showing Emad precision-guided missiles in store which the United States says can take a nuclear warhead and violate a 2010 U.N. Security Council resolution News Yahoo, Jan 5, 2016. Iran test-fired ballistic missiles. Iran claims that they can develop missiles as they are 'not designed to be used with nuclear warhead' (which is a silly excuse, redesign for a different warhead is not going to be a big hurdle). The rocket, named Safir-2 or 'Phoenix' in Persian, can reportedly carry a 250-kilogram satellite. Iran provided small number of troops in support of Iraq (apparently at Beiji refinery compound) -unofficial report. Updated Nov. 6, 2014 7:22 p.m. WSJ: Obama Wrote Secret Letter to Iran’s Khamenei About Fighting Islamic State Presidential Correspondence With Ayatollah Stresses Shared U.S.-Iranian Interests in Combating Insurgents, Urges Progress on Nuclear Talks. 10.9.15 Democratic filibuster prevented Senate vote on resolution disapproving Iran deal. Chances of such vote, if it happens, to survive presidential veto are low as enough Democrats support it. With this, the fight turns to whether and how sanctions may be lifted. US Navy released a video which depicted the Iranian army missile firing in the vicinity of the US aircraft carrier "Harry Truman" and a merchant ship. US command claims that the missiles were fired during the exercise of Iranian forces in the Strait of Hormuz on December 26, 2015. The short video shows how 5 gunboats, membership of which is almost impossible to establish, launch missiles toward them from passing in front of a large ship, probably an oil tanker. The US Navy specified that the footage was filmed by an American anti-submarine helicopters SH-60 Seahawk, taking off from an aircraft carrier, "Harry Truman." Rusvesna , Jan. 9, 2016. "We lost contact with two small US naval craft en route from Kuwait to Bahrain," the official said. He said that the Iranians informed the US that the sailors were safe and "will promptly be allowed to continue their journey". The incident happened near Farsi Island after one of the ships encountered mechanical problems. After the incident, US Secretary of State John Kerry immediately called Iranian Foreign Minister Javad Zarif to begin negotiations. An unnamed official told the Associated Press that Mr Kerry "personally engaged with Zarif on this issue to try to get to this outcome". It is not clear when the sailors will be released. Iran's 'pile of cash video, shown in Iran on Feb 15, 2016 . Aug. 23, 2016. U.S. Navy video of the guided-missile destroyer USS Nitze being harassed by four Iranian Revolutionary Guard Corps Navy patrol boats. Sept. 8, 2016. Questions asked on Iran receiving frozen funds of up to 33.6 billion USD -freebeacon.com, and Mark Dubowitz congessional testimony. Oct. 12-13, 2017. An announcement expected, with some details released by WH press service TASS, Guardian. Iran has showed off parts of its new Russian-made S-300 air defense system during its Army Day celebrations (BBC). Iranian media say that the S-300 contract is now in the fulfillment stage and may be completed by the end of the year (march in Iran). Coincides with Putin visit to Iran and talks with the supreme leader of Iran Ali Khamenei -TASS. (Trade and Syria discussed in particular). Russia has decided to freeze its shipment of S-300 anti-aircraft missile system to Iran, Kuwaiti newspaper Al-Jarida reported on Saturday. The paper quotes a highly reliable source as saying that Russian President Vladimir Putin ordered to suspend delivery of the advanced aerial defense system because Iran failed to lived up to its promise not deliver advanced weaponry to the Lebanese terrorist organization Hezbollah. 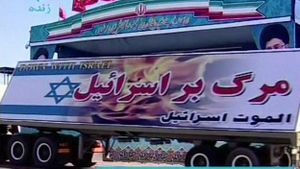 The source, who wished to remain anonymous, told the Kuwaiti paper that Putin based his decision on information he received from Israel, proving that the Iranians had transferred the advanced Russian-made SA-22 surface-to-air missile system to Hezbollah more than once. Another video with S-300 missiles themselves (or Chinese equivalent?). Also photos, and more videos on defence-blog (English) and Cassad update. 8 Apr. 2016 Russia & Iran negotiate canal from Caspian Sea to Persian Gulf (as well as railroad version), RT. 20 Apr., 2016 Iran minister: Qazvin-Rasht-Astara railway to be built by late 2016, trend.az, map, project opening report/photos. 8 Aug. 2016. Trilateral meeting, Azerbaijan, Iran, Russia, organised by Azerbaijan President Ilham Aliev. Public statements made at the meeting were about developing economic cooperation and trade, Caspian sea projects, North-South transportation corridor, and opposing common terrorist threats. Aliev spent some time on Nagornyi Karabakh issue. Statements made at Putin-Rukhani meeting are translated to English here. Teile für schwere, offensive Waffensysteme werden aus dem Iran via Syrien offenbar zur Wartung nach Russland gebracht. Shi'ite cleric among 47 executed in Saudi Arabia, stirring anger in region, Reuters, Jan 2, 2016. 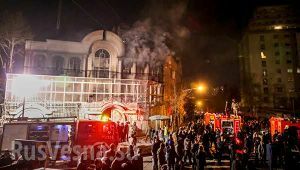 Saudi Embassy in Iran is set on fire, Rusvesna report and videos, Jan 3, 2016; + TASS. Abas Aslani, Fars, Source told us that at the time of storming Saudi embassy in Tehran, none of embassy staff were in the building & all are now safe. Saudi Arabia accused Iran of sponsoring terror, Yahoo News. US Department of State, John Kirby, January 2, 2016. We are particularly concerned that the execution of prominent Shia cleric and political activist Nimr al-Nimr risks exacerbating sectarian tensions at a time when they urgently need to be reduced. In this context, we reiterate the need for leaders throughout the region to redouble efforts aimed at de-escalating regional tensions. A critical comment on that by Konstantin Kosachev , chairman of the Foreign Relations committee, Russian Federation Council. He talks mostly on double standard, failure to criticize just Saudis, and preparing to blame Iran and Syria in case of disturbances, FB and Rusvesna, Jan 3, 2016. Yemen conflict: Saudi-led coalition ends ceasefire, BBC, Jan 2, 2016. Saudi Embassy personnel has left Iran, Rusvesna, NPR, Reuters. Disturbances reported in the town of Al Qatif, where the Sheik was arrested. Some light armored vehicles on fire on the video . Rusvesna, report and videos. Russia calls to resolve differences at the negotiations table- TASS. (Well, Russian stance is clear, whether it is possible in the near to mid term future remains to be seen). Hezbollah in Syria numbers and capability estimate: Washington Post, July 23, 2016. Iranian control of the Strait of Hormuz appears to be claimed by the head of the navy of Iran’s Revolutionary Guards, Gen. Alireza Tangsiri; denied by the US Sec. State Pompeo (Fox News, 28 Aug. 2018). ↑ Reza Najafi:'Amano ‘ineligible’ to inform Congress of roadmap', 1 Aug. 2015, MEHR News (Iran). This page was last edited on 28 August 2018, at 19:21.